I started 2019 going for a hunt New Years Day, got up early and headed out glassing some nice looking clearings it didn’t take long to spot a nice spiker on a small clearing he was feeding while I was busy ranging,dailing and trying to find a shooting spot. Long story short I missed but shooting over the top of him. I will pretty pissed but went and had a look and sure enough I had shot to high. I got home and unpacked my gear then went to a mates farm fired one shot at a gong setup at 250yds and middled it so put the miss down to rushing the shot at the spiker. Fast forward to this morning go for another hunt and spot a deer right on first light range and punch the numbers into Shooter on the phone and it is all up the wap saying D4.3 Moa. So I put the range in again making sure I have the right rifle and ammo combination and still the same numbers come out. Glassing deer and scratching my head trying to work out where things are going wrong. Give it to my mate to have a look at and he figured out that the look angle was miles out at -75deg which makes zero at 800yds or there abouts which is possibly why I missed the spiker last week. Any how with the deer patiently waiting and Shooter now giving the right numbers I settled in and took the shot at the now yearling feeding at the shot it took two steps and fell over, cool job done. Look back at clearing for landmarks and there is a deer standing in the same spot so I settled in and dropped it on the spot right now we have the retrieval job to do. hillclima, Norway, Tahr and 26 others like this. Bloody good effort. Have to love it when a plan comes together. Yummy summer yearlings. great effort I think 90% of us will have done the same thing at least twice over our hunting lives...oh dear Ive shot 2..big carry head now. 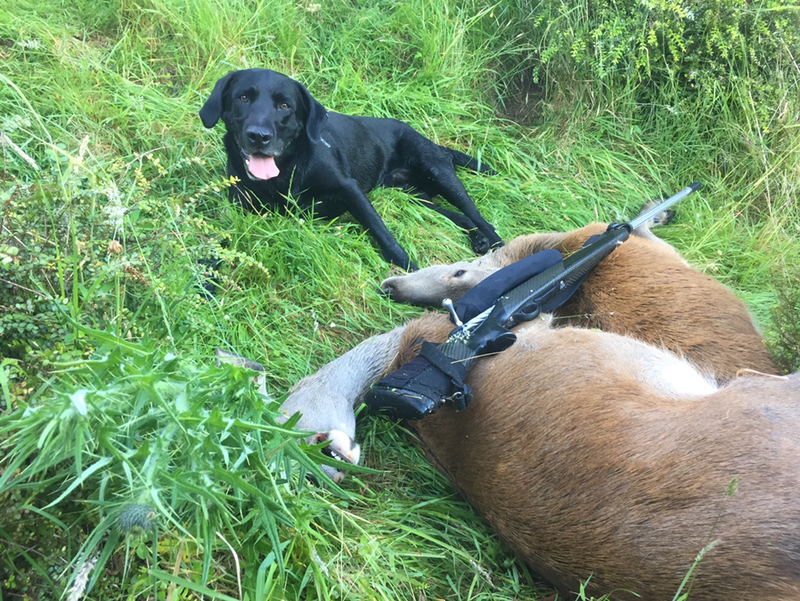 enjoy that primo venison and give the dog a pat. Bloody electronics but at least you got it sorted, good shooting nice load of the best eating meat you can get, those yearlings now are in their prime, enjoy the venison. That's going to be some good eating right there. I'm jealous! Nice work @Shootm how are the legs and back feeling? That’ll teach them; stay off the grass! Did you get the snapper? Nah the sea was rough as guts. Awesome effort @Shootm - good to see you're still slaying em. Turns out it's not so bad.